BOLINGBROOK, Ill. — Midwestern manufacturer Pres-On, consistently receives praise, due in part, to a rare willingness to shape internal processes and capabilities to meet an individual account's specific needs. 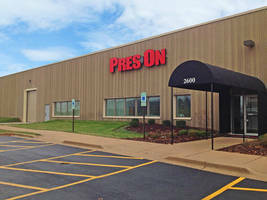 Since the relocation of the Company's three divisions: Tape Gasket, Mounting Boards, and Cap Liner to a single consolidated headquarters in the Fall of 2012, Pres-On continues to push themselves to find smarter ways to operate their business and keep their customers coming back time and time again. An architectural glass fabricating customer required faster turn times in order to keep up with increasing marketplace demand. Through careful evaluation and the re-engineering of a rotary die-cutting process to kiss-cut a wider configuration than the previous design, maximum output per foot has been optimized. Pres-On's employees can now guarantee tight delivery deadlines and meet the customer's desired price point. With sights set on future upgrades, an examination of Pres-On's mounting board cutting operation also concluded in the prior month. A plan for boosting machine power, in addition to the utilization of a stepped process to produce smaller product sizes, has been developed and will allow Pres-On to provide their existing and potential graphic display customers the flexibility to order in an increased range of quantities, enjoy a wider capability of cut board sizes with optimized turn times – a win-win for all parties. These upgrades are in active talks for potential implementation prior to the close of 2014. As a testament to Pres-On's continuing efforts to refine processes and facilitate customer success, the Commodity Manager for a leading architectural glass fabricator states: "For over 20 years, we have relied on Pres-On products…The Pres-On custom solution helped us save time and our customers save money. Pres-On understands the importance their product plays in creating a positive customer experience and their size allows them to bring new products to the market faster. Their production facility is second to none and always delivers an uninterrupted material flow to our facilities." Headquartered in Bolingbrook, Illinois, Pres-On is an innovative manufacturer of custom adhesive coatings, gaskets, and laminations serving a wide-range of major industrial markets. Founded in 1949, Pres-On has been family-owned and operated for over 60 years. To learn more about Pres-On, visit www.preson.com. Die-Cut PP Materials offer flame-retardant electrical insulation.